A Silent Voice | 聲の形 Animezing! The latest film from director Naoko Yamada and Reiko Yoshida (K-On! The Movie, Liz and the Blue Bird)! After transferring into a new school, a deaf girl, Shoko Nishimiya, is bullied by the popular Shoya Ishida. As Shoya continues to bully Shoko, the class turns its back on him. Shoko transfers and Shoya grows up as an outcast. Alone and depressed, the regretful Shoya finds Shoko to make amends. 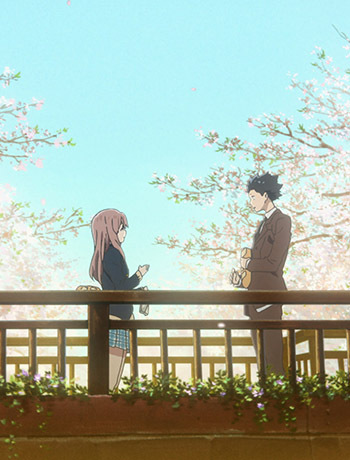 “A Silent Voice” is a moving coming-of-age drama that depicts the struggles of adolescence through its memorable characters and beautiful animation. A graduate of the Kyoto University of Art and Design, Naoko Yamada began her career at Kyoto Animation as an inbetween artist. She made her directorial debut for the series K-On! (2009) which became a major success for the studio and was turned into a film in 2011. Her next film, Tamako Love Story (2014) garnered her the New Face Award at the Japan Media Arts Festival. This was followed by A Silent Voice (2016) which was nominated for Best Animated Film by the Mainichi Film Concurs and the Japanese Academy. She recently directed Liz and the Blue Bird (2018) which was nominated for Best Animated Film at the Sitges-Catalonian International Film Festival. A prolific writer for animation, film, and manga, Reiko Yoshida made her debut in the 1990s writing for the Dragon Ball Z television series. Her first film screenplay came in 1999's DIGIMON ADVENTURE, directed by Mamoru Hosoda. In 2014 and 2017, she was awarded the Best Screenplay Award at the Tokyo Anime Awards. She has collaborated frequently with director Naoko Yamada on such films as K-On! The Movie (2011), Tamako Love Story (2014), A Silent Voice (2016), and most recently Liz and the Blue Bird (2018) which was nominated for Best Animated Film at the Sitges-Catalonian International Film Festival. This event is free and open to the public, but registration is required for security purposes. Program begins at 6:30PM. Doors open 30 minutes prior. No admittance after 7:00 PM or once seating is full. Registered guests will be seated on a first come, first served basis. Please note that seating is limited and registration does not guarantee guests a seat. To modify your registration, please email jicc@ws.mofa.go.jp. Your registration is not transferable. Thank you for your interest in JICC events. This event has passed, but please check our Upcoming Events page to see more events at the JICC. The Japan Information & Culture Center (JICC), Embassy of Japan reserves the right to use any photograph/video taken at any event sponsored by JICC, without the expressed written permission of those included within the photograph/video. JICC may use the photograph/video in publications or other media material produced, used or contracted by JICC including but not limited to: brochures, invitations, newspapers, magazines, television, social media, websites, etc. To ensure the privacy of individuals and children, images will not be identified using full names or personal identifying information without written approval from the photographed subject, parent or legal guardian. A person attending a JICC event who does not wish to have their image recorded for distribution should make their wishes known to the photographer/videographer, and/or the event organizers.